Office hours: by appointment. For Dan: book via Calendly; for Francis and Eugenia, please email. Persuasion is an important skill for designers to have—both in design practice itself, and in professional situations. Your ability to put across your message, to get other people to agree with you, to value your work, and to want to work with you, will be central to your career, both inside and outside of design. Equally, understanding what persuades you and others—how we are influenced by other people, by media, by our environment, by design—is a crucial reflective skill to develop in better understanding yourself, those around you, and more widely, society. 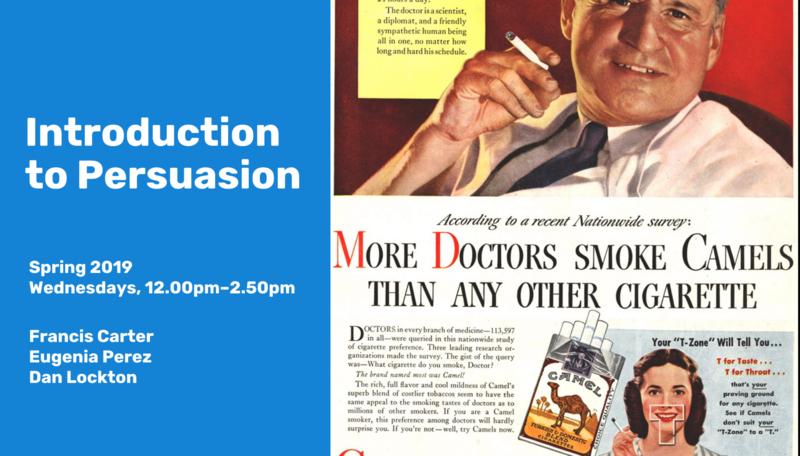 In this course, running for the third time in spring 2019, we will explore persuasion from a range of perspectives, some focused on design specifically, and some looking at insights from other disciplines and applying them within a design context. We will also examine interpersonal skills and persuasion in a professional context. This is a huge subject, and we will be introducing you to a variety of ideas and methods which form a broad body of knowledge rather than a deep dive into a single subject. The classes will be a mixture of practical activities, lectures and exercises, taught in different ways appropriate to the subject. You will do a series of projects which will enable you to apply the skills you are developing through your specializations in Products, Communications or Environments, and other knowledge and skills you bring.